As many as 900 civilians may have been killed and 600 seriously injured, including children, in more than 330 strikes since 2004, according to an Amnesty International report on the U.S. drone program in Pakistan released last fall. On the ground, that’s created a culture of fear. The White House has downplayed the number of civilian deaths associated with drone strikes while highlighting the number of militants killed. But those who live in Pakistan’s tribal region say that is subterfuge. 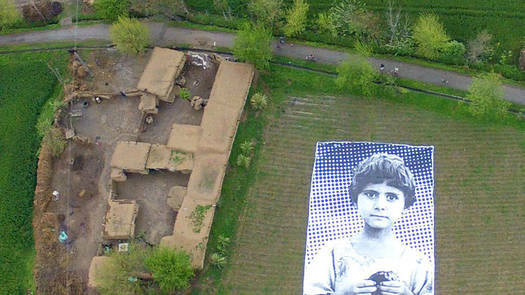 The unidentified child in the poster “lost both her parents and two young siblings in a drone attack,” the website says. The collective declined to reveal the identity of its members — comprised of artists from the United States, France and Pakistan — out of concern for their safety. This entry was posted in Military, Obama and Company, Region: Middle East and tagged drone strikes, genocide, obama, pakistan. Bookmark the permalink.